F.Y.R.O.M. | Ignoring the past is condemning the future! Ignoring the past is condemning the future! Macedonia t became the home of a large jaws population following Spain’s expulsions of Jews after 1492. The Jews formed colonies in Macedonian towns and cities, most notably Bitola ( Monastir), Skopje etc. As tens of thousands of Jews fled persecution from Spain and Portugal Sultan Bayazit II of the Ottoman Empire welcomed Jews who were able to reach his territories. The Jews was well- known for their richness so Bayazid II make them a authorization like the other Millet’s for build their own synagogue and respect their religion. For the compensation some of the Jews were replaced in Istanbul for rebuild the city after the conquered from the ottomans. In Macedonia wealthy merchant cities in the present-day is Skopje, Bitola and Stip attracted many Jews. Jews in this area prospered in the fields of trade, banking, medicine, and law, with some even reaching positions of power. In 1912 it has start the first Balkan war against Turkey, when Macedonia was divided into three parts. Jews with their refined taste of Commerce were against this division, because for them this means that will be difficult trade ties on the future. The fate of the Macedonians in Vardar part of Macedonia under the SHS kingdom was difficult, because they were considered as ‘south Serbian’. In this period Macedonian language was forbidden to use. Jews have the right to organize on religious and linguistic grounds, to have community organizations and the newspapers on the Jewish language. Jewish merchant bourgeoisie was also in a difficult situation worse than it was because the Serbian has been ruling bourgeoisie. In Germany and Hungary, spread anti-Jewish propaganda. Such propaganda remains to appear in newspaper articles about the so-called. “Jews issue.” Occur and many other prohibitions on Jews and Christians… In this period, most Jews in Macedonia live in Bitola, Skopje, and Ohrid. The number of Jews increased in 1941 when they flee the fascism that is spreading across Europe. Certainly, were the most organized Jewish communities, who often associated the Jewish population and have national, cultural, educational, religious and humanitarian nature? Even before the 1939 anti-Jewish propaganda has been shown. Jewish business people, citizens, youth, were members of the CPY or union organizations. 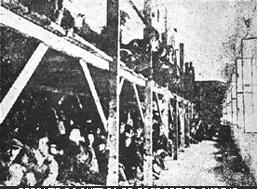 With the coming to power Cvetkovic-Macek government, have taken the first restriction and persecution of the Jews. Adopted a series anti-Jewish law. Thus began a new Jewish tragedy that destroyed 80% of the Jewish population. Турски документи за историјата на македонскиот народ опширен пописен дефтер (под редакциојата на Методија Соколоски) том 2, Скопје 1973. Турски документи за историјата на македонскиот народ, серија прва, том 2, (под редакција на Ванчо Бошков), Скопје 1966. Leon was born to a large, Ladino-speaking, Sephardic-Jewish family. Leon was born to a large, Ladino-speaking, Sephardic-Jewish family. The Frankos lived in a large house in ethnically diverse Bitola, a town located in the southern part of Yugoslav Macedonia, near the Greek border. The Frankos lived in a large house in ethnically diverse Bitola, a town located in the southern part of Yugoslav Macedonia, near the Greek border. Leon’s father, Yiosef, was a successful fabric merchant. Leon’s father, Yiosef, was a successful fabric merchant. The Frankos’ children attended Yugoslav public schools where they learned to speak Serbian. The Frankos’ children attended Yugoslav public schools where they learned to speak Serbian. 1933-39: Upon completing his schooling, Leon became a fabric merchant in Bitola. 1933-39: Upon completing his schooling, Leon became a fabric merchant in Bitola. A handsome man from a well-to-do family, Leon was popular. A handsome man from a well-to-do family, Leon was popular. His friends often remarked that he looked like a movie star. His friends often remarked that he looked like a movie star. His younger brother, Dario, idolized him. His younger brother, Dario, idolized him. 1940-44: In April 1941 the Germans invaded Yugoslavia, and Macedonia was annexed to Bulgaria. 1940-44: In April 1941 the Germans invaded Yugoslavia, and Macedonia was annexed to Bulgaria. The Bulgarians introduced anti-Jewish laws and cooperated with the Germans. The Bulgarians introduced anti-Jewish laws and cooperated with the Germans. 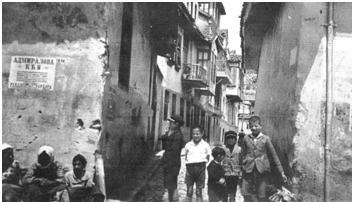 Leon and Dario fled to Kastoria, a town in Italian-occupied Greece. Leon and Dario fled to Kastoria, a town in Italian-occupied Greece. There, Leon met and married Rebecca Pissirilo. There, Leon met and married Rebecca Pissirilo. After Italy surrendered, the Germans deported Kastoria’s 700 Jews to Salonika, where they were assembled for deportation to Auschwitz. After Italy surrendered, the Germans deported Kastoria’s 700 Jews to Salonika, where they were assembled for deportation to Auschwitz. In Salonika, Leon’s wife, who was nine months pregnant, was taken by the International Red Cross to a hospital. In Salonika, Leon’s wife, who was nine months pregnant, was taken by the International Red Cross to a hospital. Leon was one of 700 Jews deported by train from Salonika to Auschwitz on April 1, 1944. Leon was one of 700 Jews deported by train from Salonika to Auschwitz on April 1, 1944th Both he and his wife perished. Both he and his wife perished. Their baby, Esther, was saved by a nurse in the hospital. Their baby, Esther, was saved by a nurse in the hospital. By United States Holocaust Memorial Museum, ‘The Holocaust in Macedonia— Deportation of Monastir Jewry’, accessed on 24 June 2011; Mark Cohen, author of Last Century of a Sephardic Community: The Jews of Monastir, 1839-1943 (Foundation for the Advancement of Sephardic Studies and Culture, New York, NY). In 1941, some 78,000 Jews lived in Yugoslavia including about 4,000 foreign or stateless Jews who had found refuge in the country during the 1930s. Although Yugoslavia had reluctantly joined the with Germany, the Yugoslav government was toppled by an anti-German military coup on March 27, 1941. Nazi Germany invaded the Balkan nations of Yugoslavia and Greece in early April 1941. Supported militarily by her Axis allies, Germany quickly subdued the Balkans Yugoslavia was partitioned among the Axis allies. Bulgaria annexed Yugoslav Macedonia (the area including the cities of Skopje and Bitola in southern Yugoslavia). 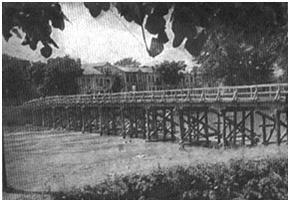 On October 4, 1941, the Bulgarians enforced an extraordinary measure that prohibited the Jews of Macedonia from engaging in any type of industry or commerce. All existing Jewish businesses had three months to transfer ownership to non-Jews or sell their assets and close down. In addition, a law that barred Jews from certain areas of town was enforced in Monastir in late 1941. Jews who lived in the more prosperous part of Monastir, located on the east side of the Dragor River, were forced to move to a poorer part of town located near the traditional Jewish quarter on the west side, and this area became the ghetto. With Monastir’s Jews forced into a ghetto and registered, it became easier to carry out the theft of their property. On July 2, 1942, the Bulgarian government demanded that all Jewish households hand over 20 percent of the value of all assets, including property, furniture, cash, and household items. Committees were established to assess the value of the Jews’ property. The possessions of those who did not have the money to pay the tax were sold at auction. All of these degrading, restrictive measures halted normal Jewish life in Monastir. Zamila Kolonomos, a local Jewish woman, lived through these years of occupation in Monastir. She wrote, “Ansina la vida si truko i no avia mas ni enkontros, ni fiestar, ni bodas, ni aligrias” (Thus life was so greatly changed and there were no more get-togethers, no festivals, no weddings, no celebrations). Though allied with the Germans, the Bulgarian government refused to deport Jews residing in Bulgaria proper. Bulgarian authorities did, however, deport Jews without Bulgarian citizenship from the territories of Yugoslavia and Greece which Bulgaria occupied. They deported the Macedonian Jews in simultaneous actions that began in the early morning of Thursday, March 11, 1943. In Monastir, Skopje, and Štip, where there was a tiny population of Sephardic Jews, several hundred police and soldiers, as well as cart drivers with their carts, gathered at municipal police stations at 2 a.m. to receive instructions for the removal of the Jews and their belongings. In Monastir, the Bulgarian military established a blockade around the city to prevent escapes. At dawn we heard the uproar of groups of police. In a moment there was the sound of horses’ footsteps and the noise of carts. Then all was calm. Then came a noise like thunder….We asked each other what it could be? Then we were able to discern the sound of voices, shouts, the crying of many people, of babies, of women! We were able to distinguish the words of the Bulgarians who shouted: ‘Quickly! Quickly!’ The prayers, moans, curses, the crying was clear… They were taking all the Jews, old and young, not just the youths who could work…. A river of people passed alongside us. They loaded us into cattle wagons, fifty to sixty people per wagon, including luggage. There wasn’t enough space and many had to stand. There was no water. The children were crying … A woman in one wagon was giving birth… but there was no doctor. We reached Skopje at midnight. Night. Darkness. They opened the wagons and in the darkness pushed us into two large buildings. Cars carrying the Jews from Shtip had been added to our train. Stumbling over one another in the darkness, dragging our luggage and continuously being beaten by the Bulgarian soldiers, the children, the aged and infirm tried to squeeze into the building. When the sun rose, we realized we were in Skopje in the building of the Monopoly, and that all the Jews of Macedonia had been rounded up that same day. Hunger pervaded… Only on the fifth day did the camp authorities set up a kitchen, but for over 7,000 of us there were too few stoves. Food was doled out starting at eleven in the morning, and the last ones were fed around five in the evening. Food was distributed once daily and consisted of 250 grams of bread and plain, watery beans or rice… They also gave us smoked meat, but it was so bad that, despite our hunger, we couldn’t eat it… Under the pretext of searching us to find hidden money, gold, or foreign currency, they sadistically forced us to undress entirely… In some cases they even took away baby diapers… If anything was found on somebody, he was beaten…. We were in a terrible mood. The youngsters tried to sing every so often, but the adults and the elderly people were in deep depression. We did not know what awaited us, but the dreadful treatment we received from the Bulgarians showed the value of the promises given us that we would only be taken to a Bulgarian work camp. Here and there youngsters whispered of the possibility of an uprising and a mass escape, but they never materialized. There was no prospect of it succeeding. The yard was surrounded by a wooden fence and behind that a barbed wire fence. At each of the four corners there was a sentry with a machine gun and other armed guards would patrol the yard. Also, the belief that the worst possible fate did not await us prevented such suicidal acts from taking place. Three railroad transports took the Macedonian Jews from Monopol toTreblinka. The journey typically took six days, and during this time the Jews were locked in cattle or freight cars. Several Jews died during each transport, and the living had to endure the presence of corpses. On the morning of March 22, 1943, some 2,300 Macedonian Jews from Monopol were forced to board a train consisting of 40 cattle cars. Families journeyed together, and the transport included at least 134 small children no more than four years old, and at least 194 children between the ages of four and 10. The train arrived at Treblinka six days later on March 28 at 7 a.m. Four people died on this transport. The overwhelming majority of these Jews were from Skopje. Each wagon carried between 60 and 70 people with all their baggage. The people came out of the building carrying their belongings on their backs. Everyone was carrying things, from the oldest person to the youngest. With bowed heads, all approached the black train. In front of each wagon stood a German and a Bulgarian policeman checking off a list. It was impossible to sit down in the freight cars. As soon as the ‘livestock’ had been loaded into a car, it was locked and sealed. Only heads were visible through the small windows… Those of us in the building were not permitted to watch, and the police waved their machine guns toward our windows to keep us from watching. The train was ready and left about eleven o’clock. Hands were waving goodbye from the small wagon windows and all of us in the building were shedding tears. The last train carried around 2,400 Jews, approximately 2,300 of whom were from Monastir. The Jews began boarding the freight cars at 6 a.m. on March 29 and by noon the train was full. The departure of this train for the killing center at Treblinka signaled the final destruction of the Monastir Jewish community. The Jewish community in Skopje survives very different and tumultuous development. Although established in a relatively conservative environment very quickly begins to accept new ideas and began to be more interested in science and politics, social and other problems. In cooperation with scholars from the Zagreb Jewish community in Skopje youth poured into deeper political and other problems associated with juidisam . From that cooperation has been developed mass movement, which mostly have been covered by the youth .This youth movement don t have only political character . it has a cultural resurgence of youth that they are most opted from the Hashomer Hacair. Their activity is conducted within the, organization of various performances, parties, lectures and meetings that led to the creation of a monumental and comprehensive youth organization. These youngsters during the summer vacation went specially organized conferences, camps and vacations where they met with people of the same way of thinking from across the country and often abroad. At those meetings they were discussed various political and organizational issues that contributed to the development of Jewish culture in Skopje. From that time increasingly began to sing Hebrew songs and are more free to discuss for the problems of Palestine and Judaism in general. Apart from supporters of the movement Hashomer Hacair had supporters of Vladimir Zhabotinski. They are called “betarim” and two or three years in a row with his companions met other groups from Yugoslavia in camping near Palic Subotica. However, this movement gained sympathy from the wider masses. Most young people in the 30’s went to Palestine and there are some included the kibbutz. Some of them are alive today: Nice Salmon-Haim and Almon-Bata Ruben. The people who went to war in Palestine is still alive Dikov Tia, who in Israel has long been customs officer, now retired. From the jewish youth often it has been born a different environment of cultural and public life in Skopje. With the merger of various youth organizations created a cultural literary Gideon Society. Company literature often organized meetings in which works were read to members. Often organized lectures, dances, sketches were performed, shows and etc. The lectures were organized in the Jewish club were they have become quite crowded. The topics wernt only of the jews question , it was more with the question of the society . For the lecturers were invited renowned experts in Skopje for individual questions. Here are some topics of the lectures held in 1936 to Jewish beginning of the war: “Zionism, the establishment, development and goals of the movement”, “Dreyfus affair”, “Civil War in Spain”, “Palestine and the problems related to it,” “Secret arms in the world and its achievements “,” Oil and the struggle of the great powers of petroleum resources “and so on. The performances should be noted unforgettable “Jewish” – dramatization of the eponymous opera composer Halevi. The performance in 1939 was staged at the National Theatre and has attracted the attention of the entire cultural community in Skopje. We conducted an open stage performance at several come to frenetic applause and cheers. Free play directed by actor and director Joseph Srdanovikj. Jewish youth also was active in the actions organized by CPY and progressive youth of Skopje. The picnics are organized around Skopje, often discussed the problems of the working class and other political issues. As a cover to police illegal organization served Yugoslavian – Czech League which represents advanced Skopje intellectuals and members of the CPY. In this organization together and performing various tasks and young Jews. Finally it should be mentioned that Jewish youth in several attempts aimed to create conditions for various types of sporting activities.). It was purchased equipment and accessories but the results were not a long life. The reason should be sought in the lack of facilities and greater financial means, or in understanding the older generations for such activities. However, sporting activity was present among Jewish youth through membership in other sports organizations (gymnast organization “Falcon”) and other sports clubs. Unfortunately, the earthquake in 1963 destroyed the thoroughly Jewish street. the face of the earth disappeared – after the destruction of the Jews – the last trace of a vital community that existed here for centuries. Newly reconstructed Skopje has a completely different urban concept and the notion that the Jewish neighborhood is increasingly disappearing from the memory of old citizens of Skopje. Jews from Bitola, camp in Skopje. Measures against the Jews are in constant growth and their intensity increases. At the end of 1942 the Bulgarian government and the fascist German Nazi government entering into direct and concrete talks “fully resolve the Jewish question”, or liquidation of the Jewish population in Bulgaria and in the territories occupied by it. In this sense we can serve and report on 12 November 1942 the Ministry of Foreign Affairs to the German legacy in Sofia. Bulgarian government with great pleasure to announce that finally solve the Jewish question. They agrees to exert all their forces for joint eviction of Jews from Bulgaria and Romania. They also asks Germany to submit detailed plans for the eviction of Jews from Romania to take necessary action for eviction of the Jews. The Bulgarian government agreed to pay a lump sum for evicted Jews but considers that the fee rahjmarki 250 per person is extremely high. The committee for Jewish Affairs has given an order to make lists of the entire Jewish population in Macedonia, with the names of all family members, age, gender, profession and tge address . The deadline for submission of the main lists was only a few days. Delegates of Jewish municipality was in charge despite the list of the Jewish population of Skopje to submit lists of Jews living in places where, because few are established Jewish communities, including: Kumanovo, Presevo, Udovo, Gevgelija, Kriva Palanka and Bujanovac . The available data show us that in 1941 there were 1181 in Skopje in 3795 family members in Bitola, 810 families with 3351 members, Stip 140 families with 551 member, Kumanovo seven families with 17 members in three families with Gevgelija 11 members in Titov Veles 2 families with 8 members, Kriva Palanka in a family with 5 members in other places six families with 28 members, a total of 2150 families with 7762 members, Jewish communities increase in arrivals from other places, so that Macedonia has some 8,000 persons of Jewish origin. After signing the contract, follow Protocol. 32 Ministry Council on March 2, 1943, which provide organizational measures for the deportation of 20,000 Jews from the “new” and “old” areas of Bulgaria and property seizures. And order the main directorate of railways, without compensation, with special trains to transport Jews from Macedonia and Belomorieto to places designated by club for Jewish issues. The rekvization committee’s orders in settlements identified by committee for Jewish Affairs to confiscate buildings necessary for the creation of concentration camps where they will be accommodated persons of Jewish origin. Mobilize civilians, which after the emigration of Jews to be the guardians of Jewish property until their liquidation. Guards will be paid from the fund “Rvrejski municipalities,” All immovable properties of the evicted Jews are taken away in favor of the state. All movable property of persons of Jewish origin to be evicted will be sold by committee for Jewish issues, on special order, and the amounts will be entered into the fund “Jewish communities”. He urges the Commissioner for Jewish Affairs moved 20,000 troops to Jews, as provided in the agreement with the German authorities. Commissioner for Jewish Affairs issued Regulation on organization and operation of temporary camps. Rules advance provides extremely inhumane acts, and in practice has proved that they were break . I will mention only a few members to confirm the above. So, no heating, and winter 1943 was extremely cold. Article 13 provides that the detainees were leaves covering, clothing and food, everything else takes them. In Article 18 are prohibited from seeing through windows and open, to write letters and read newspapers. Article 25 provides food twice a day, and for children up to 10 years three times a day, etc.. Issued ten orders that persons appointed to various departments in the camp from March 9, with different levels of wages. The camp buildings were adapted for the Skopje state monopoly, which was near the railway line and suitable for further transport of Jews. Everything was ready for collection the kingdom of Macedonia. Anxiety among the Jewish population was larger. While preparations are in the greatest secrecy through various channels, including through national liberation activists and party organization, it emerged that something against the Jews. Do not know in which scale and which will be internalized, in Bulgaria or elsewhere, and speaking that will take only men work. The death camps were nothing heard or someone that knows something. Fascist propaganda press and told only the removal of Jewish forced labor. Several nights before deportation nobody put out the lamps. bags, backpacks, repair dilapidated garments and shoes – for every eventuality. All dressed lay, fear and cold, with the hope that the worst will not happen. On March 10 a delegation of Bitola Jews was received by Bishop, who generously not to allow anything to happen to Jews. The delegation welcomed many citizens and Jews joyfully received news that was just a lie. The night between 10 and 11 March 1943 the cities of Bitola, Stip and Skopje were blocked and Jewish settlements surrounded by a Bulgarian army and police. In the early morning hours of March 11 began gathering Jews. From house to house went after several armed officers, agents and soldiers. The roughest possible way out of beds take it out women and children, the sick were loading into trucks. The police called upon them to take all valuables and money, because they will need in the future, and that will bring good in Bulgaria. Looting occurred at the spot in the house, the collection of the Jews. It continued on to the railway station in Bitola and Stip, then the State monopoly in Skopje.